Mrs. Carolyn Jean Pierce London of Greensburg, Kentucky, daughter of Marie Skaggs Pierce of Greensburg and the late Alton Pierce was born on August 20, 1958 in Green County and passed away Thursday, January 31, 2019 at her home. She was 60 years, 5 months, and 11 days of age. She had made a profession of faith in Christ and was a member of the House of Prayer. 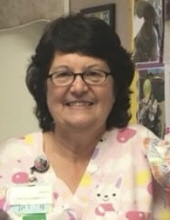 She was also a Licensed Practical Nurse for 40 years and was employed with Green Hill Rehab and Care Center in Greensburg. She united in marriage to James Dwight London who also passed away on Thursday, January 31, 2019. To this union was born a son: Jasper Dewayne London who passed away on Thursday, January 31, 2019. Besides her mother, Carolyn is survived by her mother-in-law: Julie Marie Whitlock of Glasgow; a granddaughter: Sydney Marie London of Greensburg; two brothers and sisters-in-law: Junior and Valerie Pierce, and Larry and Lisa Pierce all of Greensburg; two sisters and brothers-in-law: Joyce and Stevie Ervin, and Connie and Jimmy Hutson all of Greensburg; other brothers-in-law and sisters-in-law: Deston and Anita London of Ohio County, and Daniel and Deena London of Elizabethtown; grannies girls: Sierra Beams, Gracie Fonfara, Rachel Fonfara, Ricki Jo Pierce, Tosha Curry, Destiny Bowles, and Niki Curry; and a host of other relatives and friends. Mrs. London was also preceded in death by a brother and sister-in-law: James and Starlot Pierce. The funeral services for Carolyn Jean Pierce London will be conducted at 1:00 P.M., Central Time, Monday at the House of Prayer in Edmonton with burial to follow in the Pierce Community Cemetery. Bro. Phil Lowry officiating. Green Hill Rehab & Care Center Employees. To plant a tree in memory of Carolyn Jean Pierce London, please visit our Tribute Store. "Email Address" would like to share the life celebration of Carolyn Jean Pierce London. Click on the "link" to go to share a favorite memory or leave a condolence message for the family.